While most people have heard about laser assisted hair removal, the low level laser (LLL) stimulates hair follicles and the LLL therapy is used in hair loss treatment. Light Emitting Diodes (LED) are also used for the hair loss treatment, however, there almost no studies to conclude whether it's an effective modality. Laser is a focused coherent light, the depth of penetration of which depends on the wavelength. Most studies investigating effects of LLLT on the hair growth have used wavelengths that range from 635 to 650 nm (Avci, 2014). Light Emitting Diodes emit non-coherent light that is much milder in its effects than laser is. Both have been used in treatment of hair loss. Arndt-Shultz law states that every substance with pharmaceutical, healing, or poisonous properties heals in small quantities, inhibits in moderate quantities, and kills in large quantities. Applied to the laser effect on hair, it means that a treatment with large quantities of laser (high level) leads to hair removal, while a low level laser treatment leads to hair stimulation. 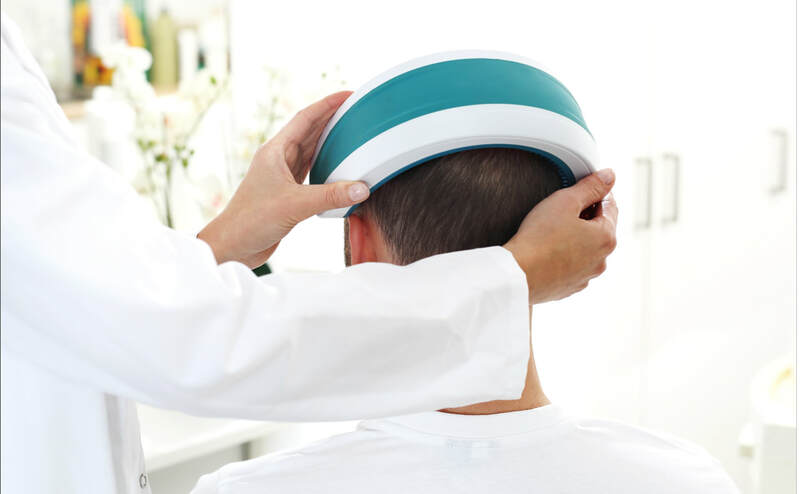 An LLLT treatment lasts between 20 and 60 minutes and consists of placing one's head under a laser emitting device. It can be done in a doctor's office or under a take-home helmet. Another option offered on the market is a laser hair-brush. The treatments are not painful. overall patient satisfaction was positive. ​For a sample treatment regiment see the following section on the combined LLLT and LED therapy. Another review of the medical literature shows that the FDA-cleared LLLT devices are both safe and effective in patients with Male Pattern Hair Loss and Female Pattern Hair Loss who did not respond to or were not tolerant to standard treatments (Zarei, 2016). Though the optimum wavelength, coherence and dosimetric parameters remain to be determined (Avci, 2014). LED therapy, just like laser, makes use of emitting light of a certain wavelength. However, LED light is more dispersed, less focused than the light from LLLT. And so it is softer, less damaging to the tissue, and for that very reason it is also generally not as effective as LLLT. LED has been used for a long time for the muscle injury treatment and it is well studied in this application. Its use in promoting hair growth is recent and only minimally studied. As of the time of this publication, there has been one study demonstrating effectiveness of the LED alone (without LLLT) on the proliferation of the human derma papilla cells and on the hair follicle growth. It was an in-vitro study (cultured cells in a tube, not on people). The study showed that the LED with the 660 nm wavelength was indeed effective and resulted in cell growth (Joo, 2017). ​There are no human studies on the LED alone effectiveness. ​There are also studies demonstrating effectiveness of a combination LLLT-LED therapy for the the hair regrowth in androgenetic alopecia. This particular study used a combination LED red light and Low Level Laser (655 nm wavelength) to treat persons with androgenetic alopecia, used for 16 weeks, every other day (60 treatments total), for 25 minutes. The device used was a bicycle-helmet like "TOPHAT655". In women, after the 16-week treatment course, the average increase in the hair count was 37% (Lanzafame, 2014). At the beginning of the treatment there may be some hair shedding. Noticeable changes begin after 2 months of consistent use; it takes up to 6 months to see the final results. Advantages - non-invasive, safe - no side effects, likely to have results, less expensive than more invasive methods. Drawbacks - requires discipline, and long-term use, not likely to have dramatic results; likely to require a one-time investment to purchase the device for at-home use.